For James Broner of Englewood, Fla., Dec. 7, 1942 is a day he will always remember. That was the day his older brother was killed by a Japanese machine gunner and he lost his left leg to a sniper’s bullet. Both incidents took place within hours of each other a few hundred feet apart at the Battle of Buna, New Guinea during World War II. James was sergeant of the 1st Platoon, Company G, 125th Regiment, 32nd Division of the Michigan-Wisconsin National Guard, the Red Arrow Division. His older brother, Willard, was platoon sergeant in the 4th Platoon. All five sons of Mr. and Mrs. Chester Broner of Muskegon, Mich., served in World War II. Besides Willard who was killed and James whose leg was amputated, there was Capt. Russell Broner, the oldest brother, who served in the same unit. In addition, Pfc. Robert Broner was injured while serving in Gen. George Patton’s 3rd Army in Europe and Pfc. Francis Broner, the youngest brother, who was a member of the occupation troops in Europe. James joined the National Guard at 18 in 1940, by that time both Russell and Willard were already in the unit. The division was activated and went to San Francisco before boarding ships for Australia in April 1942. After several months of additional training overseas, the 32nd Division left Australia and landed in Port Moresby, New Guinea. Their destination was the Japanese garrison at Buna, New Guinea, that required a month-long march through dense jungle, native villages inhabited by head hunters, and over snow-covered mountains. “We left Port Moresby sometime in October. We didn’t arrived at our objective until just before Thanksgiving,” James recalled as he retold his story six decades later from the comfort of his Englewood home. “Our route took us over the Owen Stanley Mountains that had never been crossed by any white man before. It was mountain and jungle all the way and the Indian villages we went through were inhabited by cannibals who lived in grass huts who had never seen a white man before. By the time the Red Arrow Division reached Buna their uniforms were in tatters and food was hard to come by. “During the three or four weeks it took us to march to Buna food was dropped by air,” James said. “There were times when our food didn’t catch up to us for three or four days, so we existed on what we could scrounge from the land. The Japanese garrison at Buna consisted of elite troops — Imperial Marines who defended the village and Catholic mission. The enemy’s backs were to the sea, but they were behind a concealed machine gun-defended bunker network constructed of palm logs. The machine gun nests were six to eight feet deep and impregnable to the U.S. division’s small arms fire. After American forces discovered the bodies of natives hanging from trees who had been drawn and quartered by Japanese soldiers, James said “We took no prisoners. “When we arrived at Buna we had to cross a large field with high grass. The field was surrounded by trees and the Japs had snipers in the trees,” James recalled. “I stopped in the field to talk with another platoon sergeant. I turned my head and when I turned back to look at him he was on the ground. He had been shot through the head by a sniper. “It was Dec. 7, 1942, a year to the day from the time the Japanese attacked Pearl Harbor, I was wounded. I had just gotten word that morning my brother, Willard, had been killed by a Jap machine gunner,” he said. “I decided to go down to the 4th Platoon that he commanded and check it out. Our platoons were probably 200 to 300 feet apart. James was treated by medics at a front line aid station and then carried through the jungle by eight native stretcher bearers to an air strip several miles a way. The injured sergeant was flown in a C-47 transport plane to the general hospital at Port Moresby where his useless left leg was removed at the knee. From there he was transported to Brisbane, Australia before being returned to the States for two additional operations on his leg and more recuperation. Several weeks after James was evacuated from the front lines the balance of power tilted toward the Red Arrow Division when it received flamethrowers. The 32nd Division burned the enemy out of their palm log bunkers. “None of the Japanese marines surrendered. From what I’ve been told, 300 to 500 of them swam out into the Pacific and drowned. There were no ships waiting for them offshore,” he said. On Oct. 1, 1943 he was discharged from the U.S. Army. The Muskegon Chronicle newspaper ran a story dated Oct. 2, 1944 which notes: “For his gallantry in New Guinea, action that cost him his left leg, Sgt. James Broner …was awarded the Silver Star.” He also received the Purple Heart and the Asiatic-Pacific Campaign Ribbon. For the next 30 years James worked as an inspector and supervisor in a plant that manufactured tank engines in Muskegon for the Defense Department. He and his wife, Helen, retired to their Englewood home along with five of their 10 children, five of whom were still in school. Mary Broner was in the first graduating class at Lemon Bay High School in Englewood in 1981 and Terri Broner was “Miss Englewood” in the mid-1980s. In 2005 Jim and Helen will celebrate their 60th wedding anniversary. 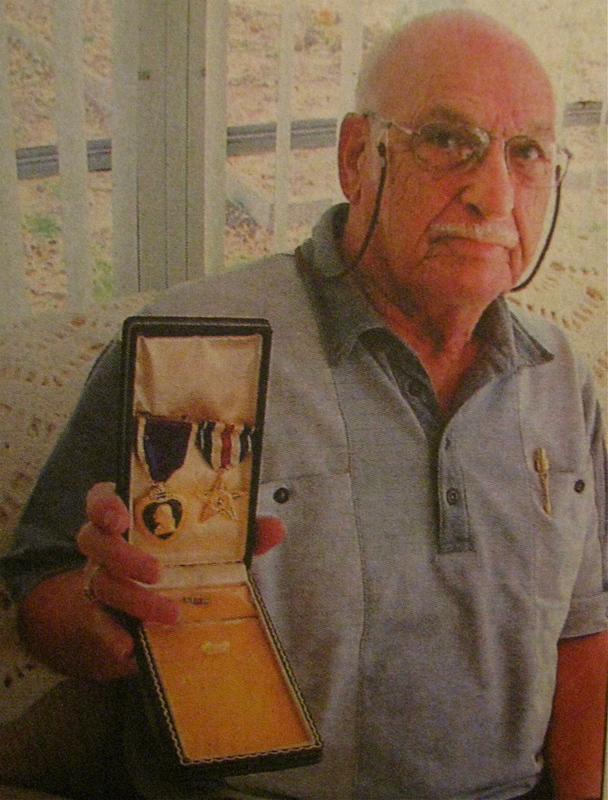 Holding his satin lined blue box containing his Purple Heart and Silver Star, James admitted the medal he is most proud of has nothing to do with war. It was also in the blue box with his military medals. The round silver medal with a golfer on the front is attached to a red, white and blue ribbon. James received it for making a hole in one 65 years ago when he was in high school. His second one was on the 17th hole at Cape Haze Links on July 12, 1993 and the last one was at Rotonda Palms on the 14th home on May 1, 1998. He still golfs three times a week at 81 and enjoys every minute of his time on the links. This story was first published in the Charlotte Sun newspaper, Port Charlotte, Fla. on Monday, March 15, 2004 and is republished with permission. Formerly of Hesperia Sergeant James Kenneth Broner, 92, died peacefully in his Englewood, FL home on February 8, 2015. A veteran of World War II, he was Sergeant of the 1st Platoon, Company G, 125th Regiment, 32nd Division of the Michigan-Wisconsin National Guard, The Red Arrow Division where he was awarded the Silver Star and Purple Heart, and The Asiatic-Pacific Campaign Ribbon for his gallantry in New Guinea. A record of his services has been chronicled in the book, “The Ghost Mountain Boys”, by James Campbell, published in 2008 by Broadway Books. Sgt. Broner was born on July 30, 1922 in Muskegon, Michigan to Chester and Orea Broner. He married Helen Stefanich in Muskegon Heights, MI, on June 2, 1945. He is survived by his loving wife Helen V. Broner; his nine children; his fifteen grandchildren; and his six great-grandchildren. He is preceded in death by his son, David J. Broner who died in 1974. A military burial graveside service will take place at the Christ the King Catholic Cemetery on Loop Road in Hesperia, Michigan on Monday May 18, 2015 at 11:00 a.m. with a memorial luncheon following at the Hesperia American Legion, 4075 S. 198th Ave., Hesperia, MI. Yes, they were different. Like him, they were something else.